Cover reveals and writing updates!! Long, long time no speak! I am so sorry for not updating more regularly, but I changed and upgraded my website and have also been in my writing cave, head down, determined to get the first three Shifters of the Glen books finished. The good news is that I have! The first book is due out in the next couple of weeks, details coming very soon. And book two will follow shortly after. 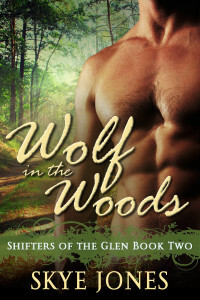 When I first wrote Wolves at the Door, Shifters of the Glen Book One, as a short novella for the Shifters Gone Alpha boxset, I knew I wanted to add to it and create more stories in tihs world. But it has grown more than I thought it would. So far, I have four books finished and in various stages of edits. I also am halfway through book one of a spin-off series – working title: Shield Warriors. This will feature shifters, but also vampires, magical immortal warriors, Seers, witches, and other magical folk. I am really excited today to bring you my first two covers. 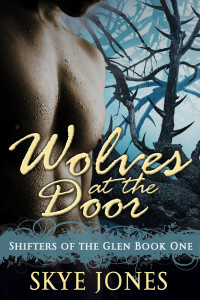 Wolves at the Door, as shown above, is book one of the Shifters of the Glen series and is due out in around two and a half weeks, I just have to finalize the release date. Wolf in the Woods is book two in the series, and due out in around five weeks time. Check out the cover for Wolf in the Woods! I love these covers and hope you like them as much as I do! Previous PostPrevious Cover reveal! Guest author. Next PostNext Closed off to You, by Rachel S. Rose.